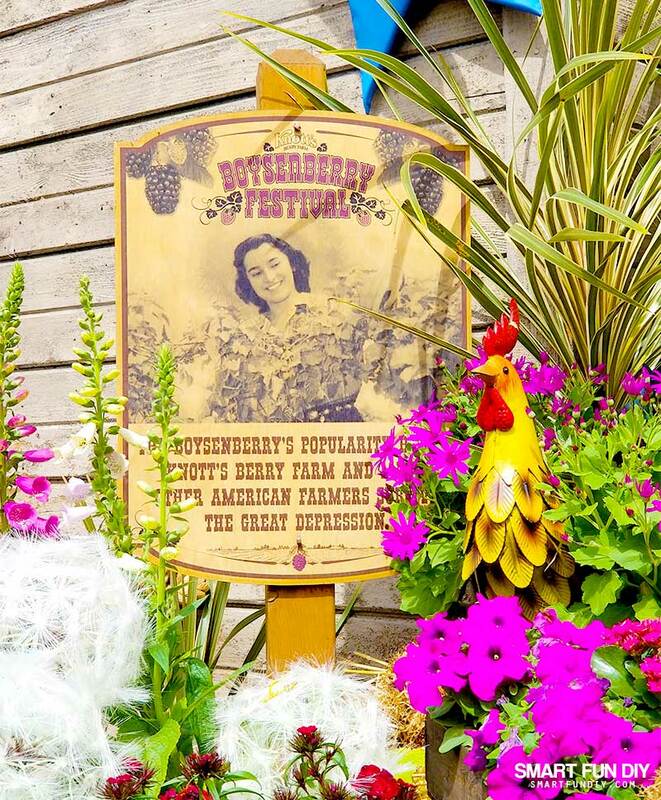 What’s the Boysenberry Festival All About? 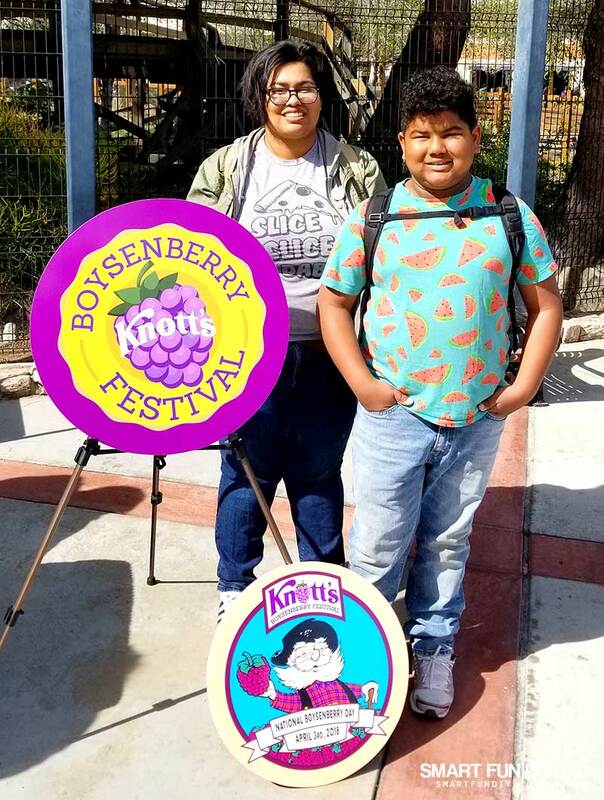 The Knott’s Berry Farm Boysenberry Festival runs from March 16, 2018 through April 8, 2018, kicking off the gorwing season of the Knott’s Family’s famous boysenberry plants. 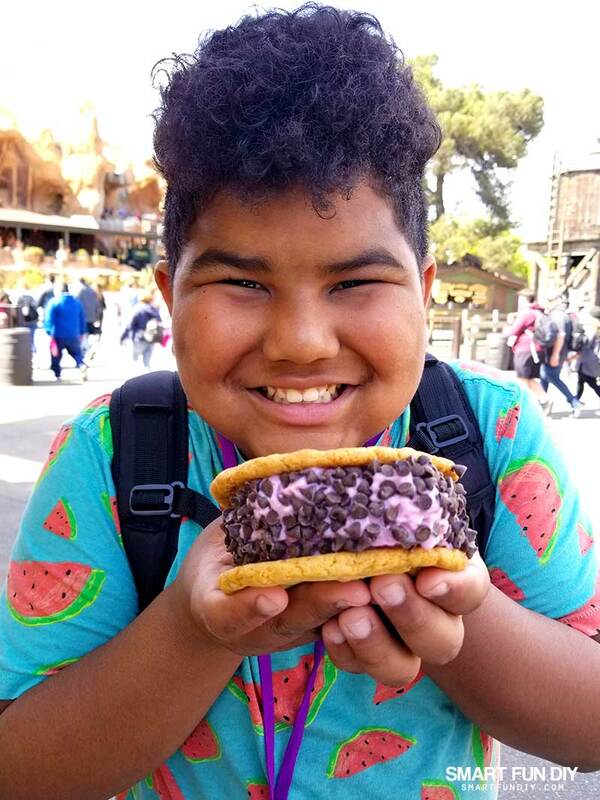 The Festival celebrates everything about the fruit, from it’s color to it’s history, highlighting it’s incredibly unique and diverse flavors through over 15 unique dishes and desserts. 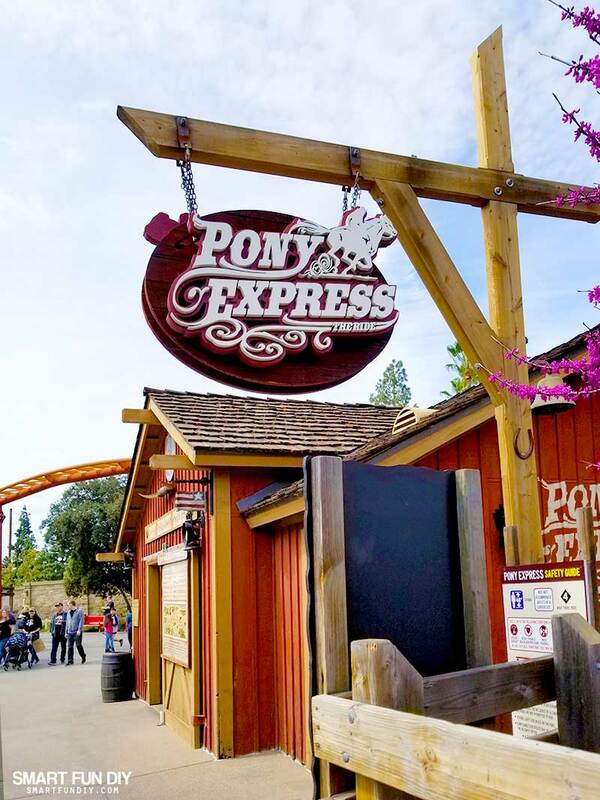 It all started in 1920 when Walter and Cordelia Knott moved their family to a 20 acre plot in Buena Park, California. A few years later, a family friend named, Anaheim Parks Superintendent Rudolph Boysen had been experimenting with a new strain of berry but the results were unsuccesful. Walter Knott started to nuture the plants, a cross between lognberries, raspberries, and blackberries, andthey started bearing fruit. He decided to name the fruits boysenberries” after his friend Rudolph Boysen. 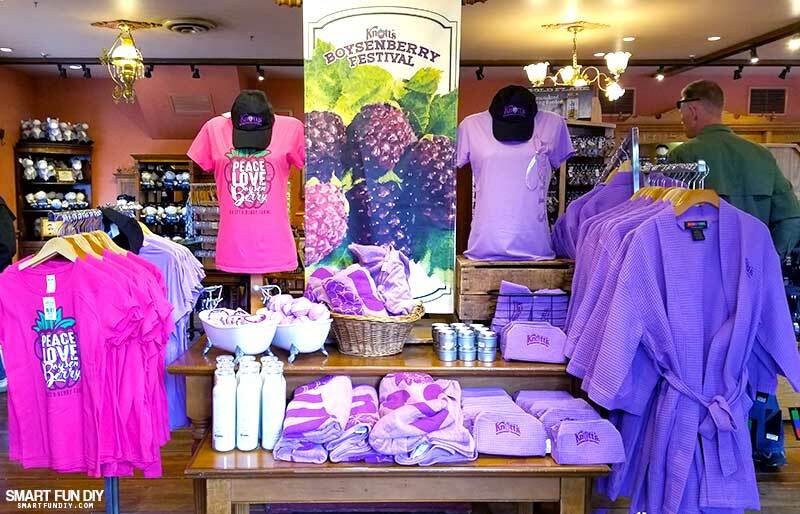 Walter Knott was the very first person to successfully produce the Boysenberry fruit. 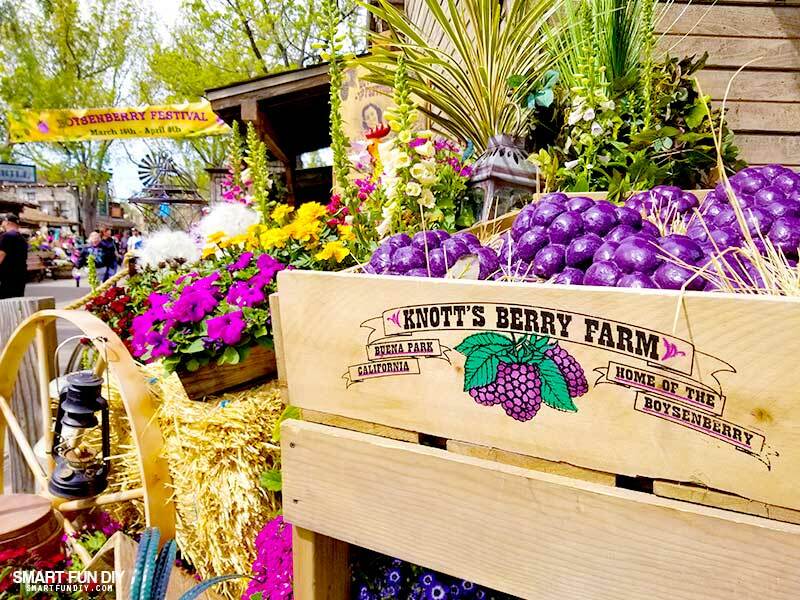 Since the 1930s, Knott’s has been the leading producer of boysenberries in the US, with over 1 million boysenberry products produced per year. 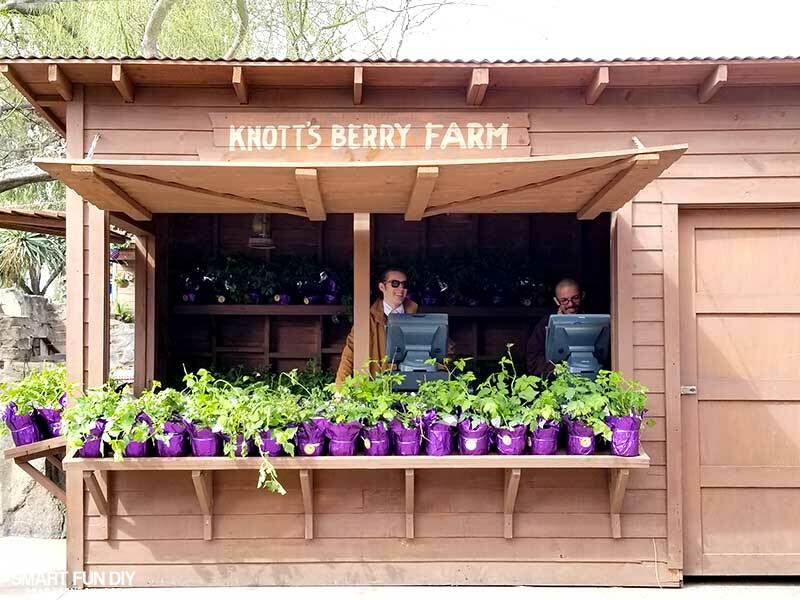 You can even buy live boysenberry plants to take home, right in the park! 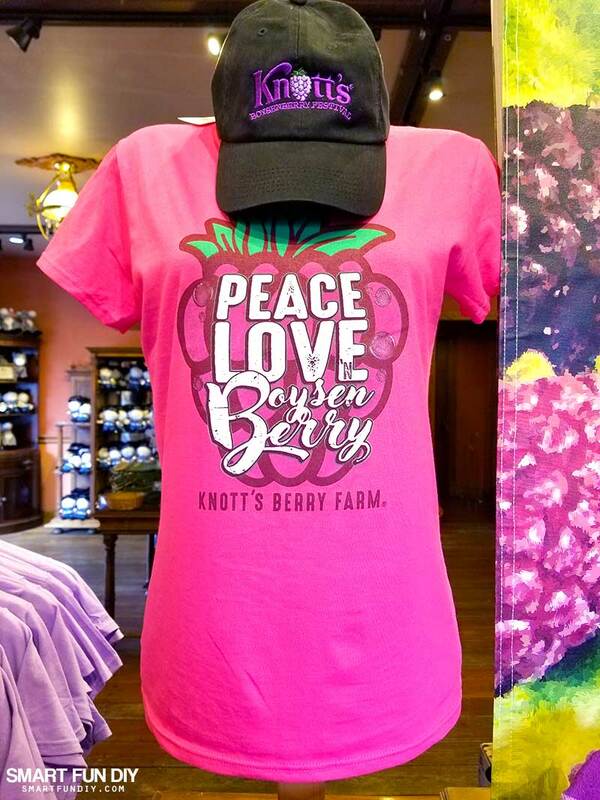 You can read more about the full history of the boysenberry on the Knott’s Berry Farm site. 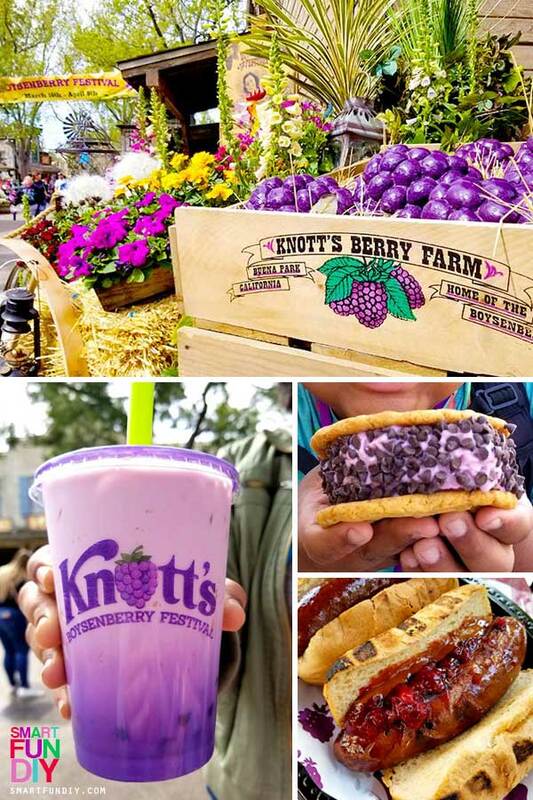 One of the biggest draws of the Knott’s Berry Farm Boysenberry Festival is the food. 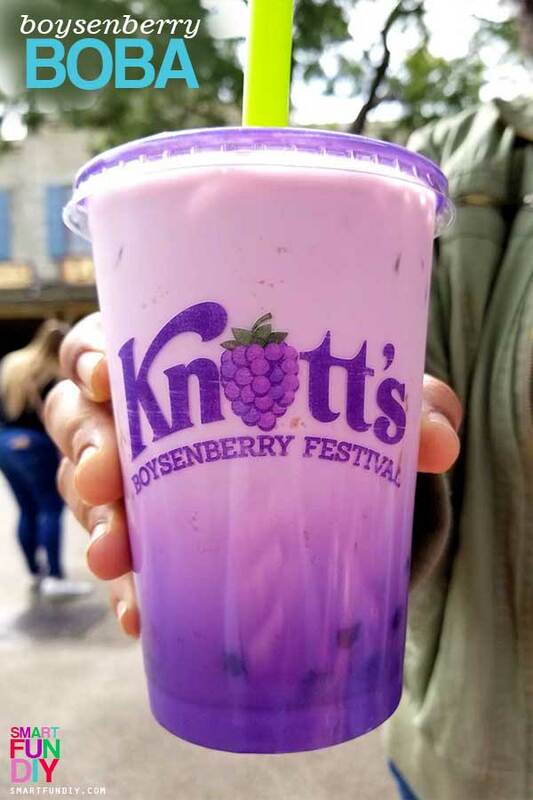 Sure, there’s staples like Boysenberry pie and Boysenberry softserve but there is oh so much more! While I was in line for the Boyseberry hot wings and started talking to a local family. 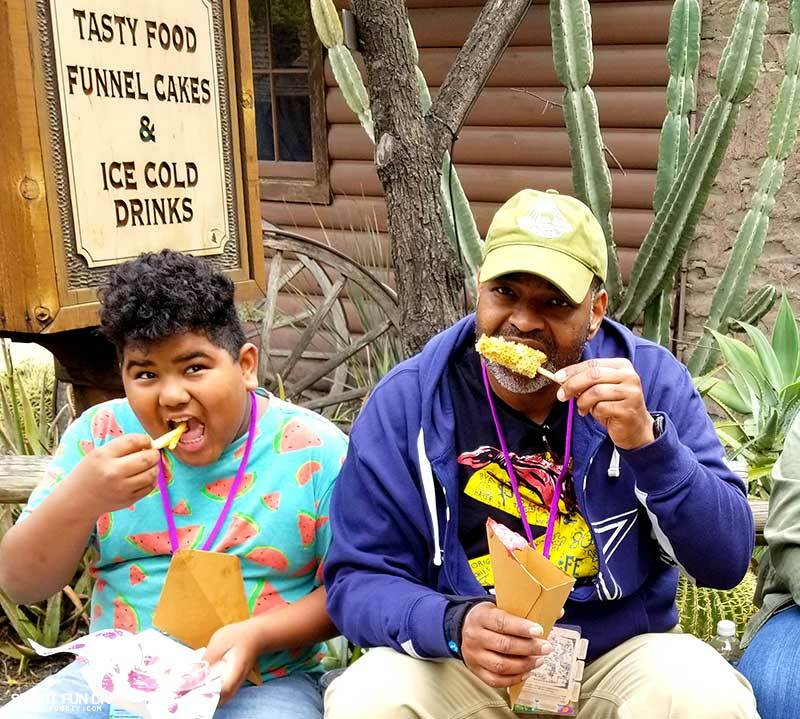 The dad said they had been there before but they made the mistake of going on rides before trying all the food. This year, they were focusing just on the Boysenberry Festival. 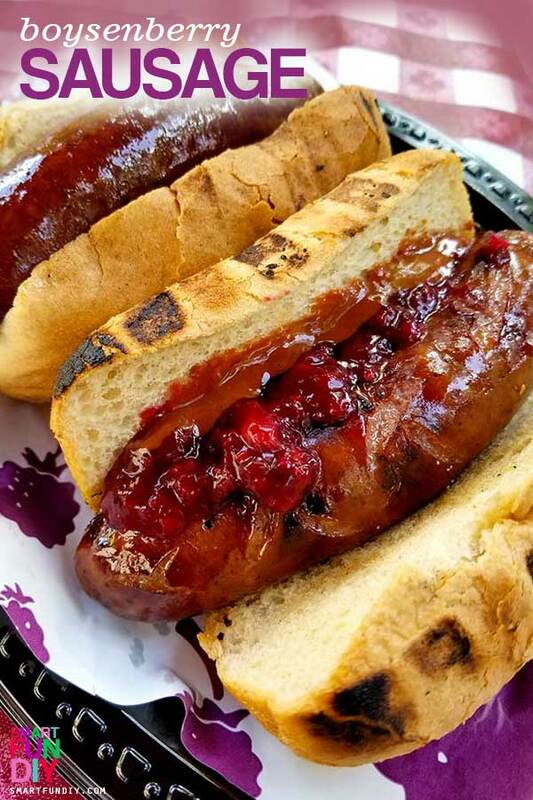 “At the Boysenberry Festival we come for the food #1”, said the dad. 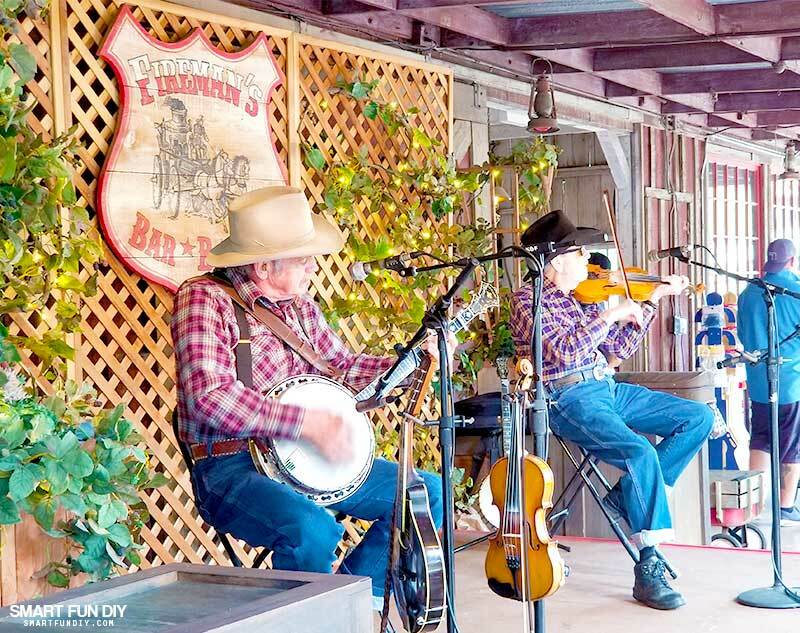 He told us that there is so much to do with the just Boysenberry Festival alone, that if you focus on that all day, you’ll have plenty to do until nightfall. 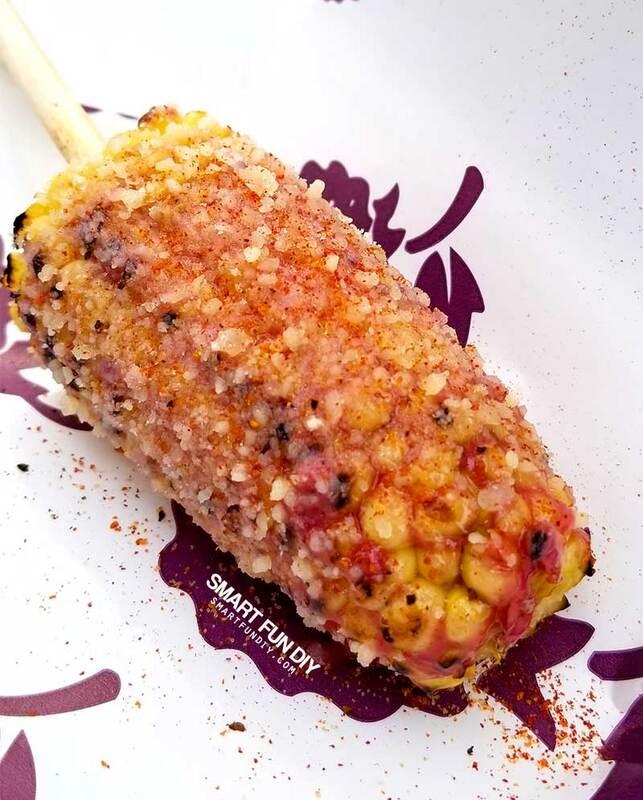 Don’t let the long line fool you; this booth has two sides serving up elotes as fast as possible. These are small, about 1/3 of a regular elote, but it;s just enough deliciousness to satisfy. 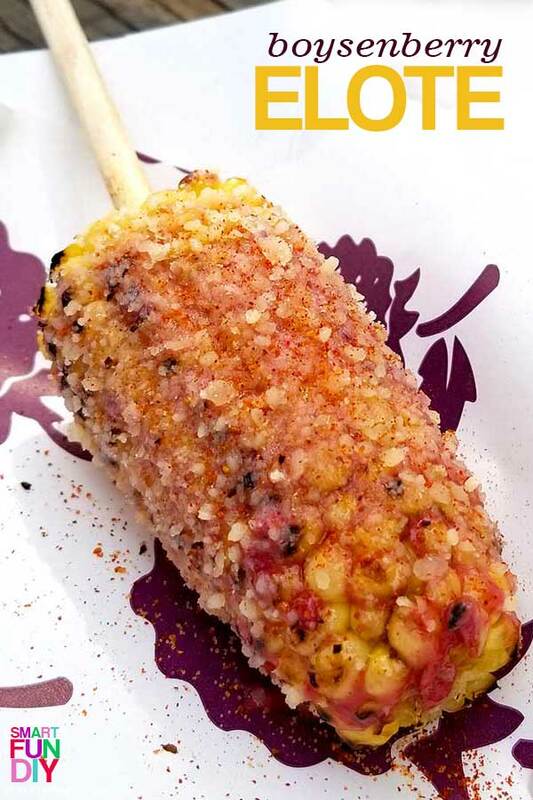 Be sure to sprinkle on some Tajin around the corner of the booth for an extra spicy kick. Go inside Spur’s Chophouse and get these delicate, fall apart short ribs in boysenberry barbecue sauce over buttery rice. We went back a second time to get another sampling of these delicious short ribs because they were so good and tender! 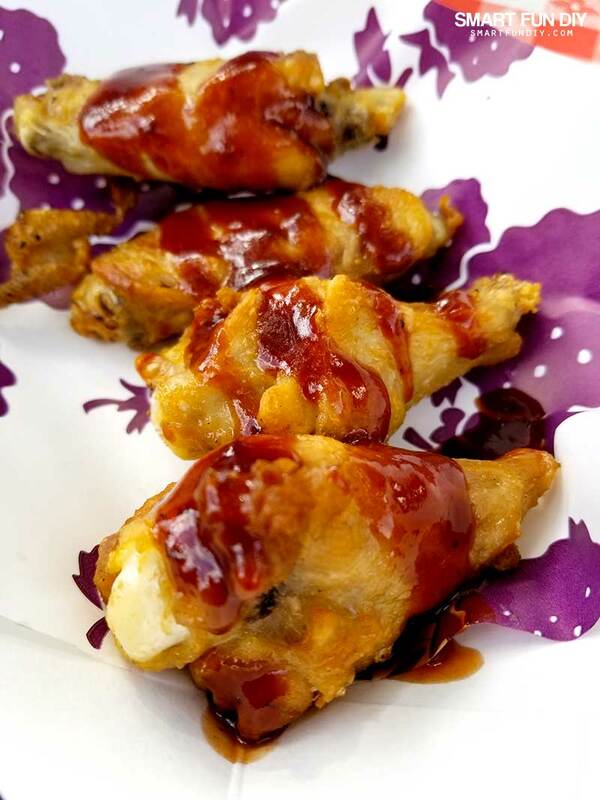 A sweet and spicy kick, these delicious hot wings are drenched in Boysenberry barbecue sauce (which you can purchase in bottles at the park). Everyone we talked to agreed that these were a fan favorite! 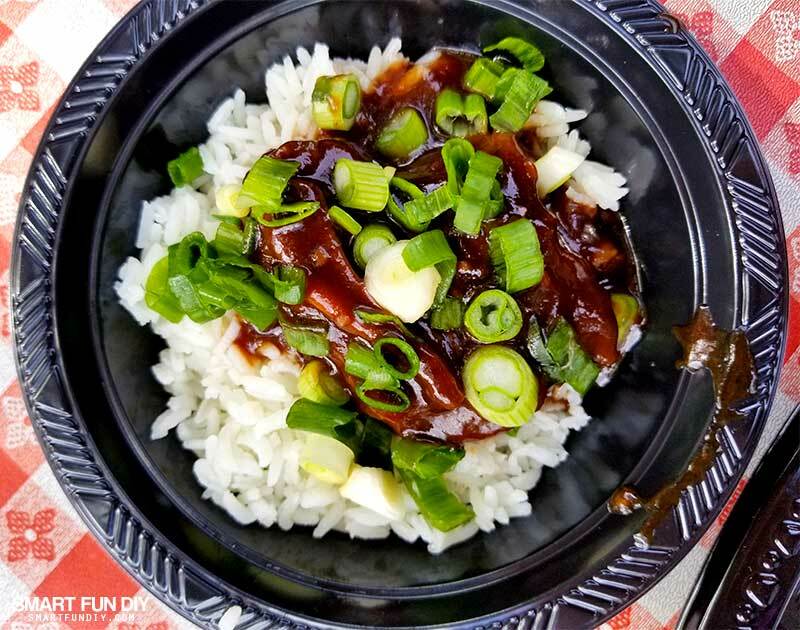 Tip: Ask for extra barbecue sauce for extra dipping … they’ll give it to you! This was my favorite treat of the day. 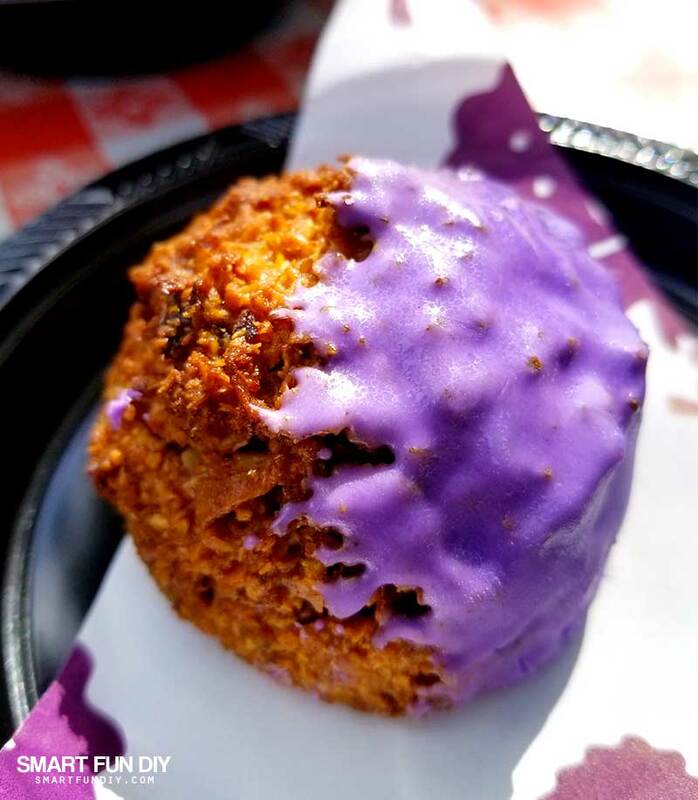 A fluffy classic glazed raised conut drenched in a boysenberry sauce. It’s perfection! Everyone wants one and everyone loved them! 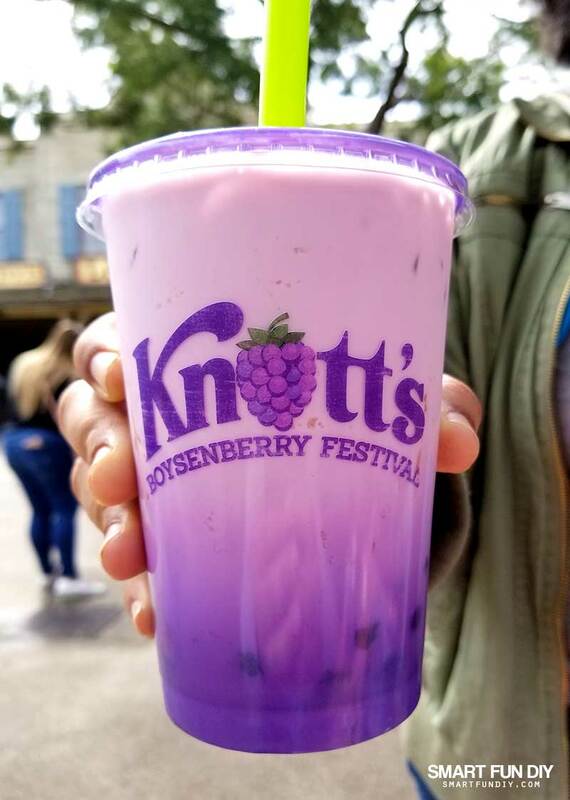 These violet colored boba drinks were pretty to look at. The kids told me the boba tasted great but the drink itself was a little milky. I woudn’t know since I have never had boba *gasp*! But it sure did make for cute photos! Now these are not the delicate french cookies everyone calls macarons. These are coconut macaroons, bascially like a haystack made with coconut and boysenberry. I thought these super delicious, however, at under $2 each, they are a better value if you buy them outright and don’t use the tasting card to purchase these (I’ll explain the tasting card later!). 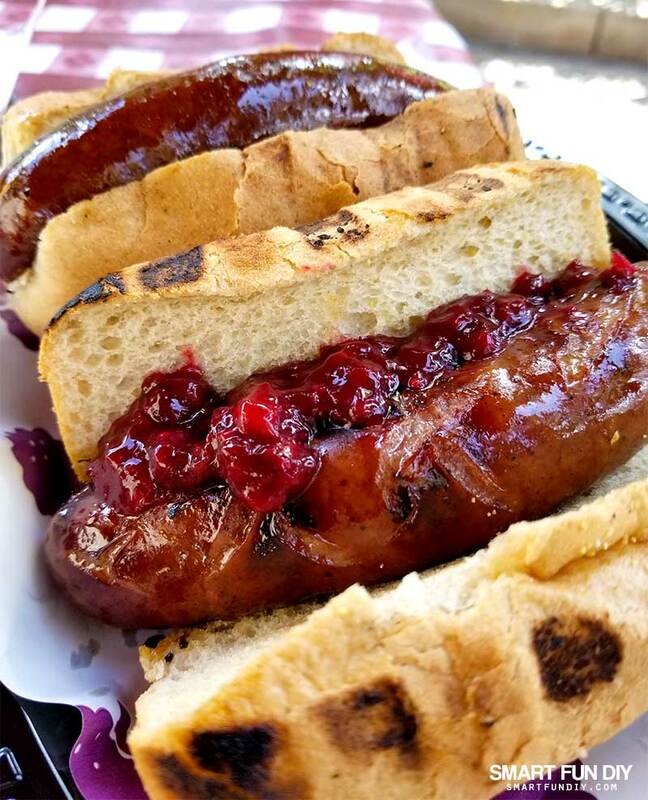 This was by far the best value of everything we tried – a yummy boysenberry infused sausage served with mustard, boysenberry barbecue sauce, and boysenberry relish. We ate 4 of them! 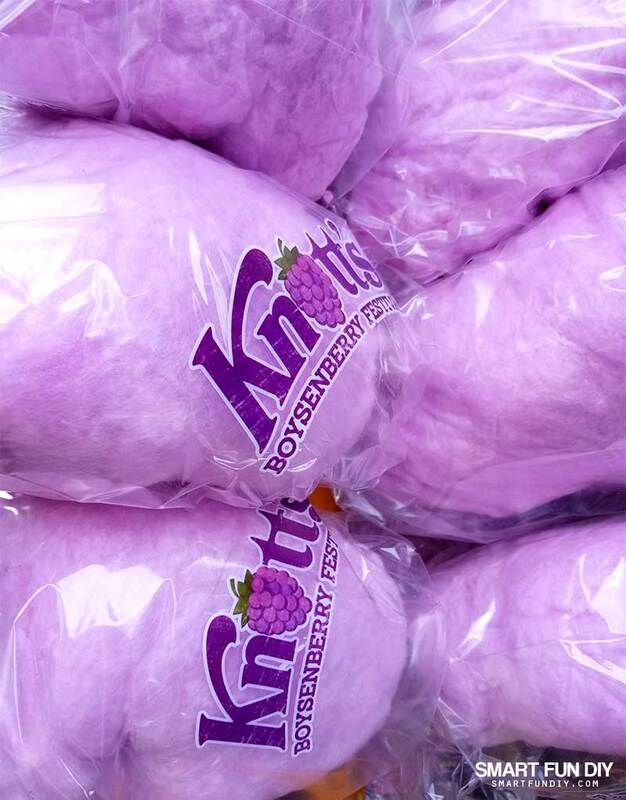 Ahhhh yes, these are so yummy … yes they taste like boysenberries!! 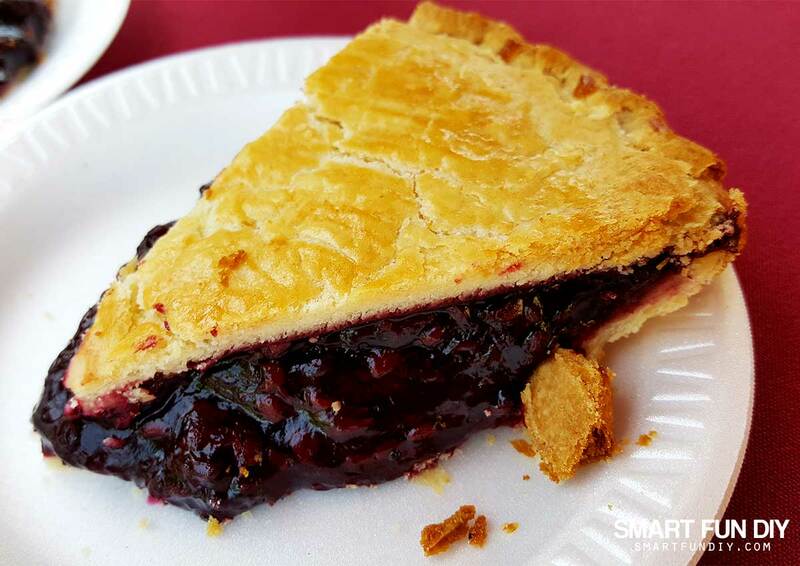 You can’t go to the Boysenberry Festival without trying the pie!!! 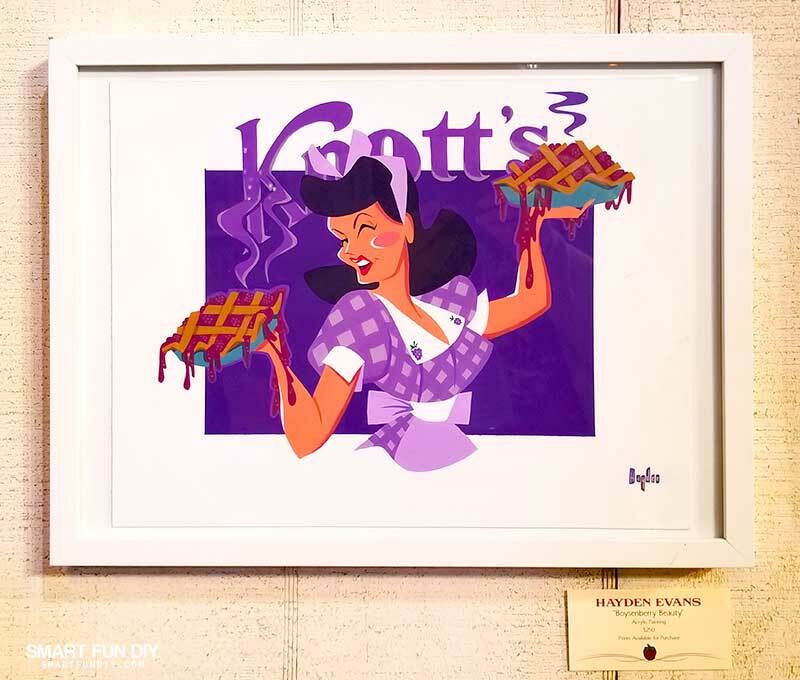 Grab a slice at the bakery or at Mrs. Knott’s Chicken restaurant. 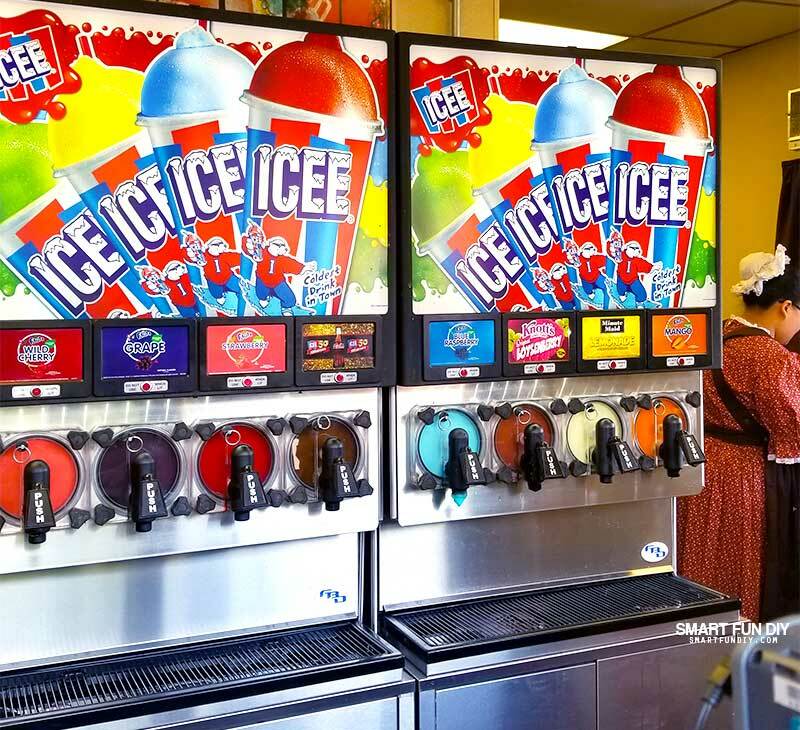 At the railroad crossing at the end of the Ghost Town is a little ice cream stand offering boysenberry softserve and ICEEs. 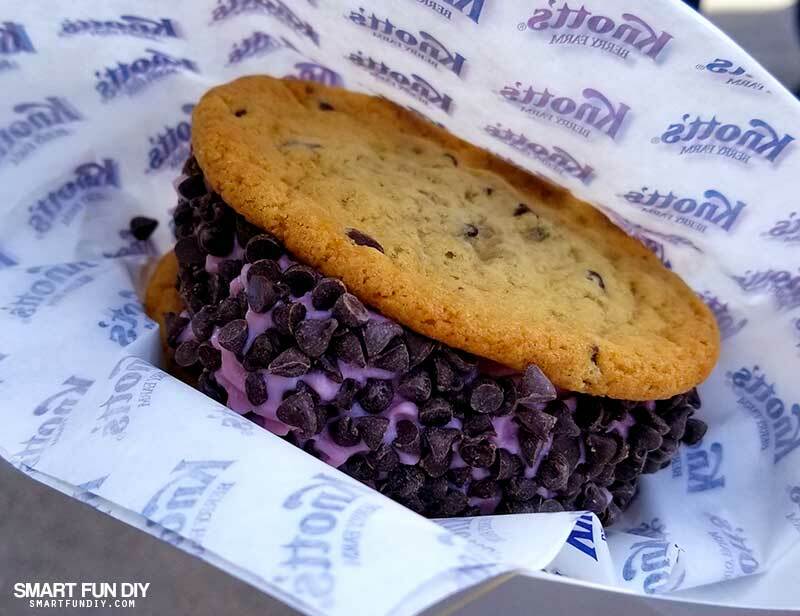 You can get a boysenerry float, which is an ICEE topped with boysenberry softserve, or a giant boysnebrry soft serve chocolate chip cookie sadnwich like this! Or you can go with a simple cone, which is always a winner. 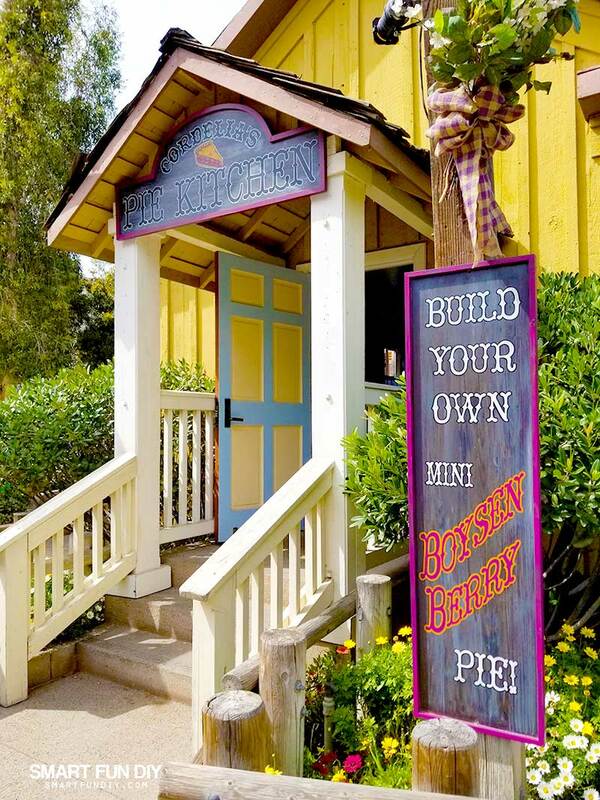 The good news is this stand is serving these boysenberry treats all year long! 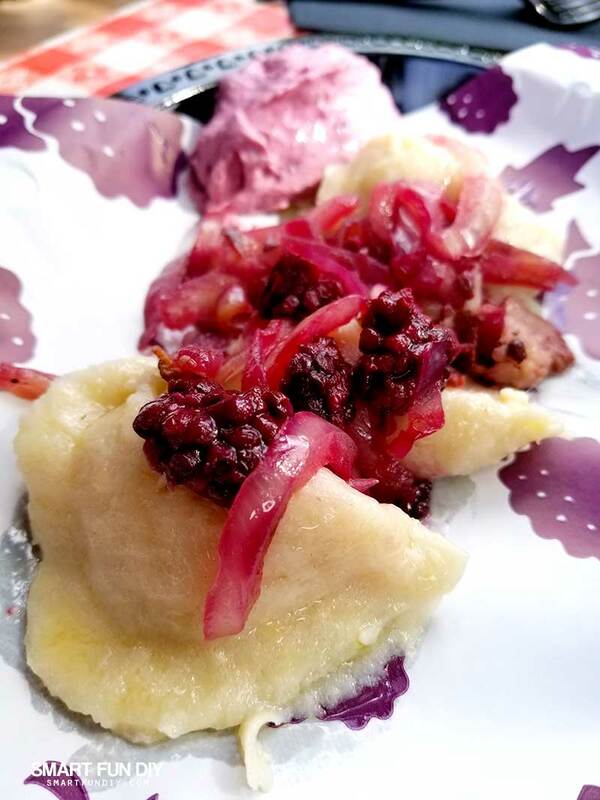 Inside Spur’s Chophouse, you can sample cheese filled pierogies with a boysenberry sour cream topping. None of us were a fan of these but the boysenberry sour cream was tasty. We asked around and almost everyone shared the same sentiment: skip these. When I heard there was alligator, I had to try it! It doesn't taste like chicken (LOL). 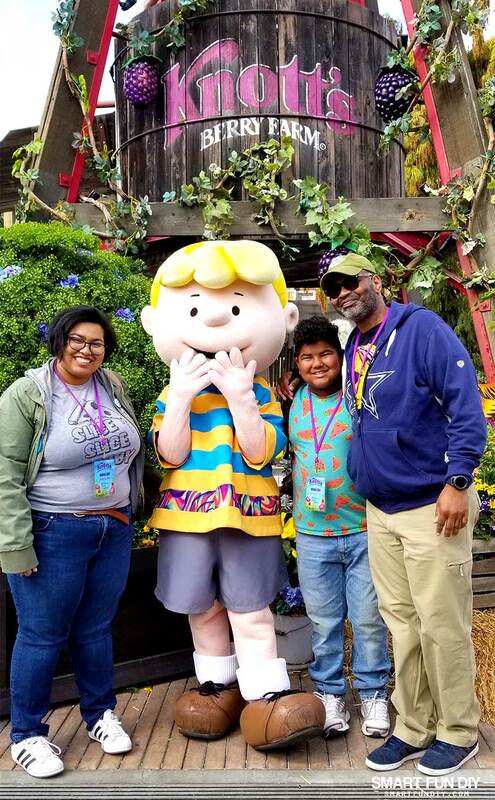 At the end of the day, the family was not a fan but I actually liked it! The boysenberry aioli didn’t stand out to me against the taste of the alligator. But if you like alligator, you might like these! These tasted okay but they weren’t part of the tasting menu so you had to buy them outright. 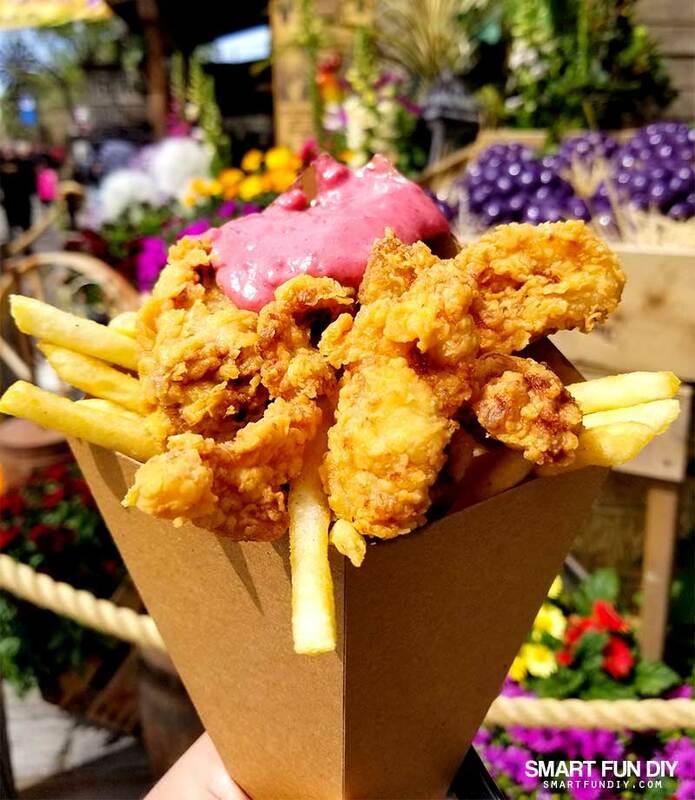 If you get the Alligator Bites, you don’t need to get the fries since the Bites come with a huge cone of fries as well. The warm pita bread was delicious but the texture and look of the hummus was yucky to me. A lot of people liked the flavor but my family was not a fan. I took a photo but it was not very attractive so I did not share it here. Imagine blueberry pancakes with Parmesan or cotija cheese on them. And then a spicy kick from boysenberry salsa. As much as I thought these tasted weird, I couldn’t stop eating them. They were strangely addicting! 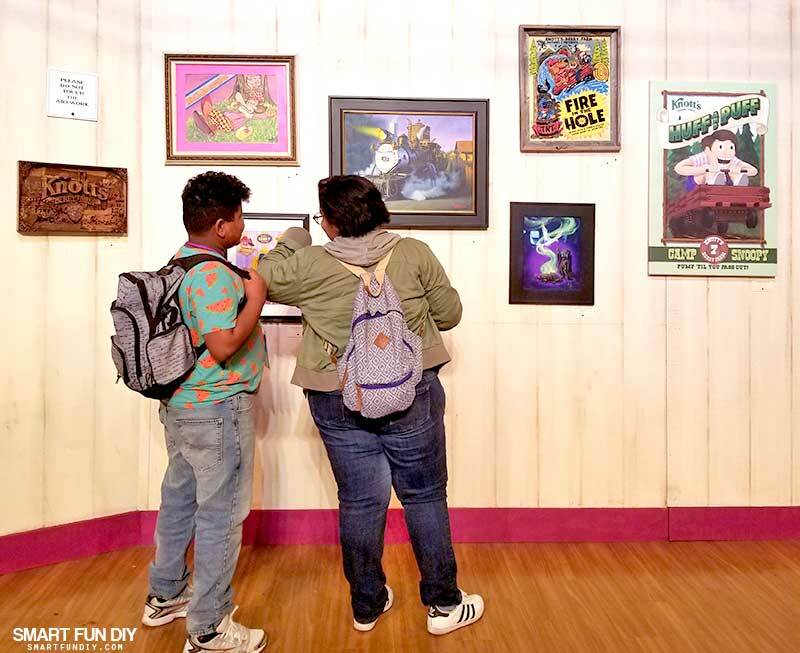 The reviews from the kids were mixed … some of them loved it and others did not. 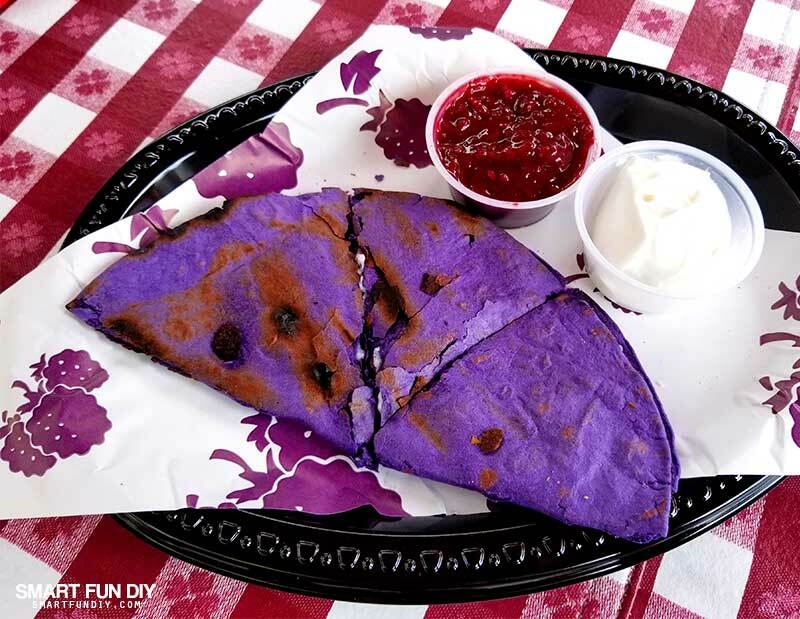 I could definitely go for more of the boysenberry salsa, quesadilla or not! 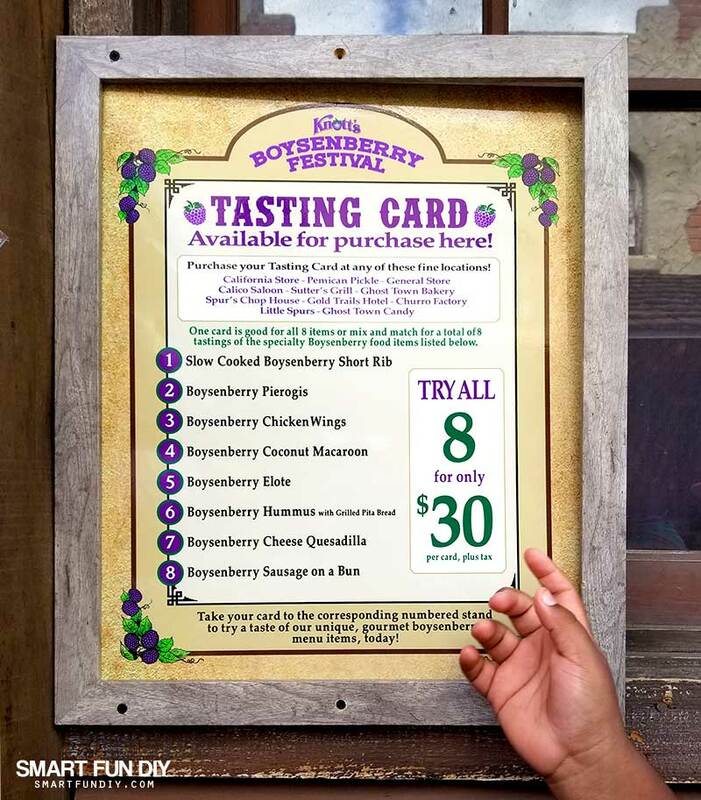 The Boysenberry Festival Tasting Card – the best deal in the park! 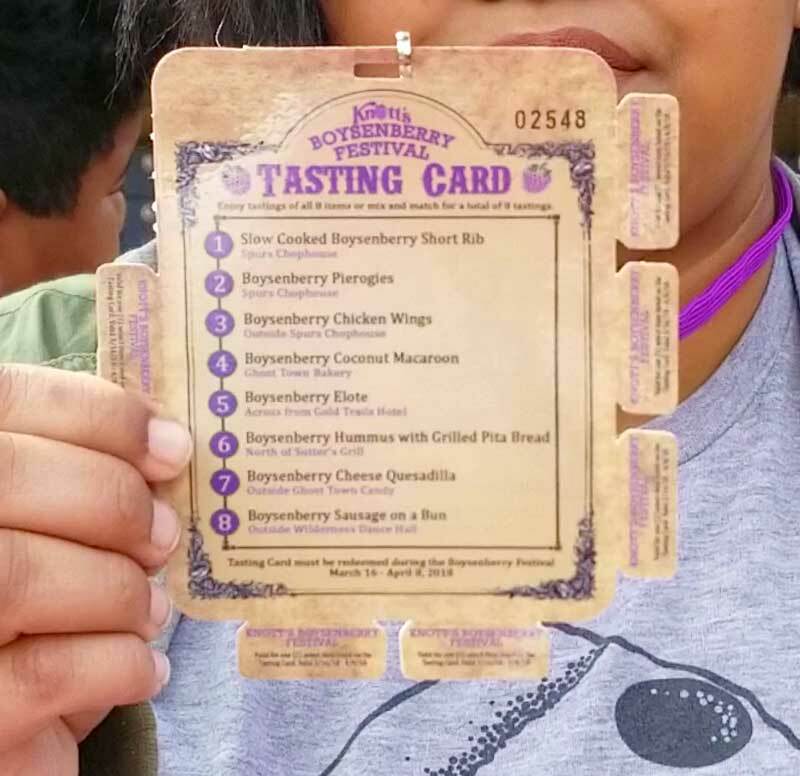 If you want to sample a whole bunch of boysenberry delicacies for not a lot of money, the Boysenberry Festival Tasting Card is an incredible deal! For $30 you get a card on a lanyard that includes 8 breakaway tabs and a list of the foods you can sample. Each tab can be redeemed for any of the samples listed. For example, if you want to skip the boysenberry hummus and instead get two orders for the Boysenberry Chicken Wings, you can totally do that! 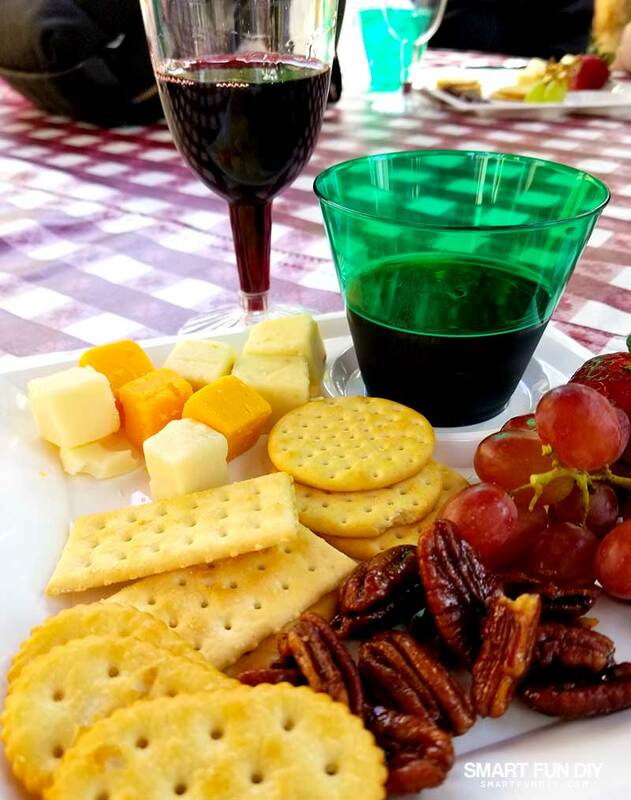 Knott’s also offers a similar card for beer and wine tasting, which includes a fruit, nuts, crackers, and cheese plate along with six different pairings of your choice of beer or wine for $25. They will check your ID and give you a wristband so you can freely go from booth to booth to redeem your tasting card. My husband Xaver used this pass to try boysenberry wine, which was a super sweet, dessert style wine. It paired so well with swiss cheese. 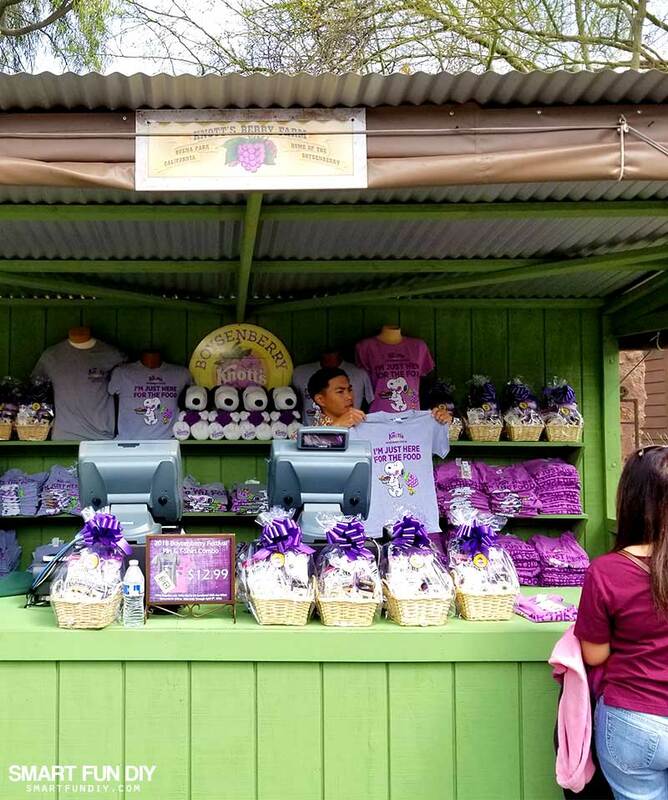 All throughout the park and at the shops near the entrance, you can find shirts and otehr boysneberry themed merch. The shirts are so cute!! 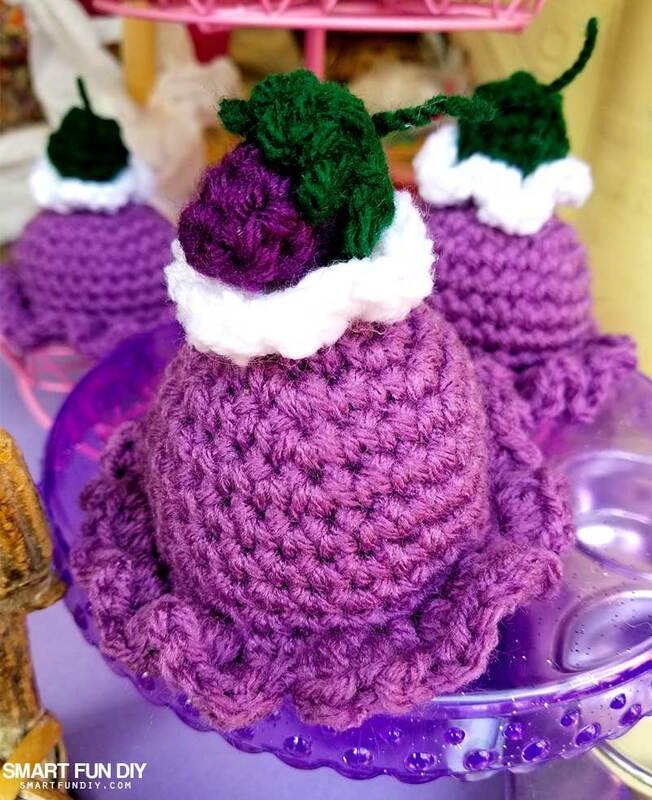 I also spotted these ladies in line to get into the park with these super crochet hats that look like bosyneberries. You can make your own or get these from one of the craft booths in the Ghost Town. 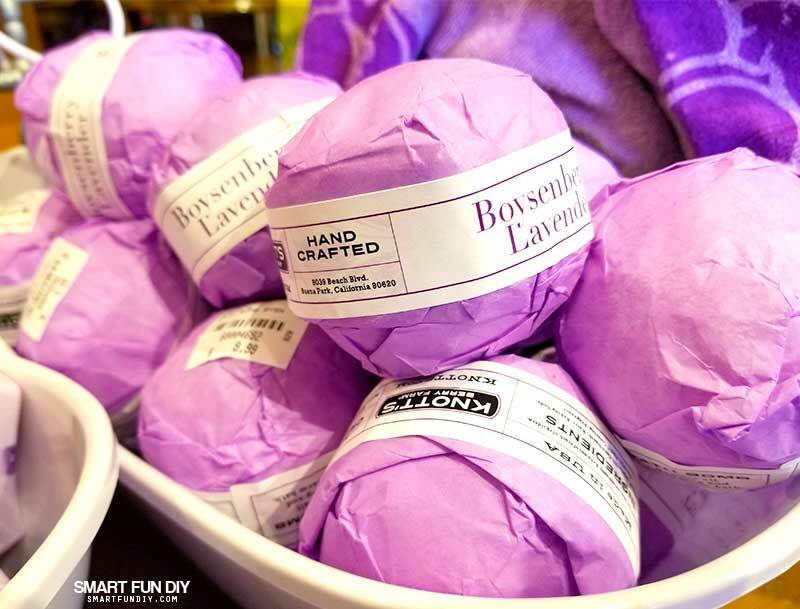 There are also t-shirts, boysenberry bath bombs, boysenberry honey, and so much more that you can pick up in the shops! 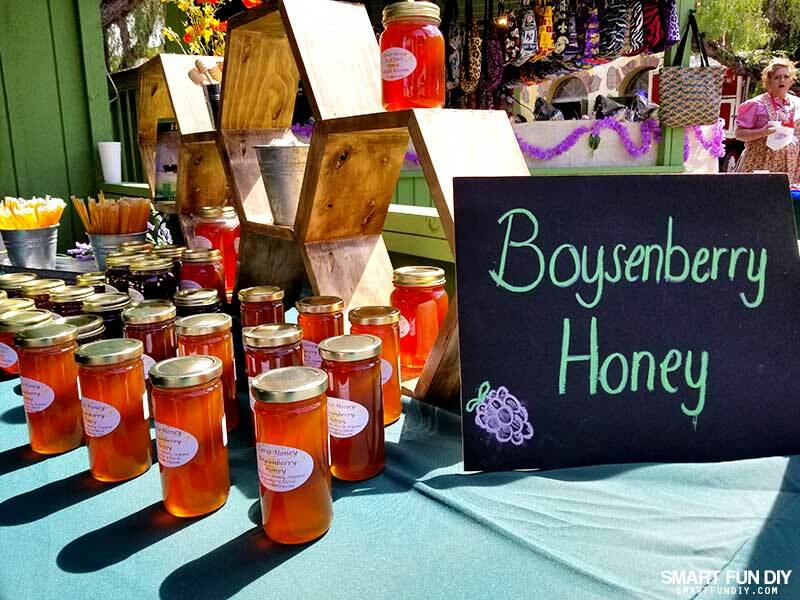 You can also purchase boysenberry packaged foods to take home to enjoy. 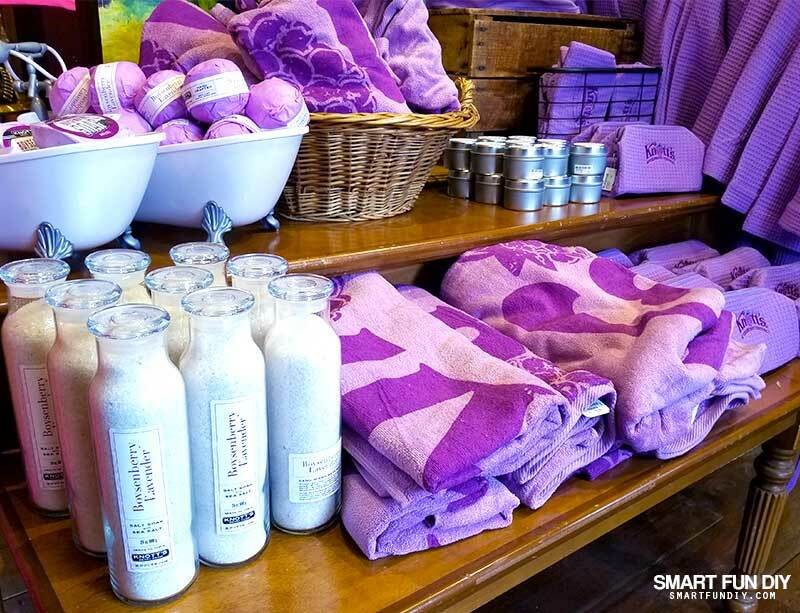 From cookies to chocolate bars to boysenberry butter and barbecue sauce, there’s something for every palette. 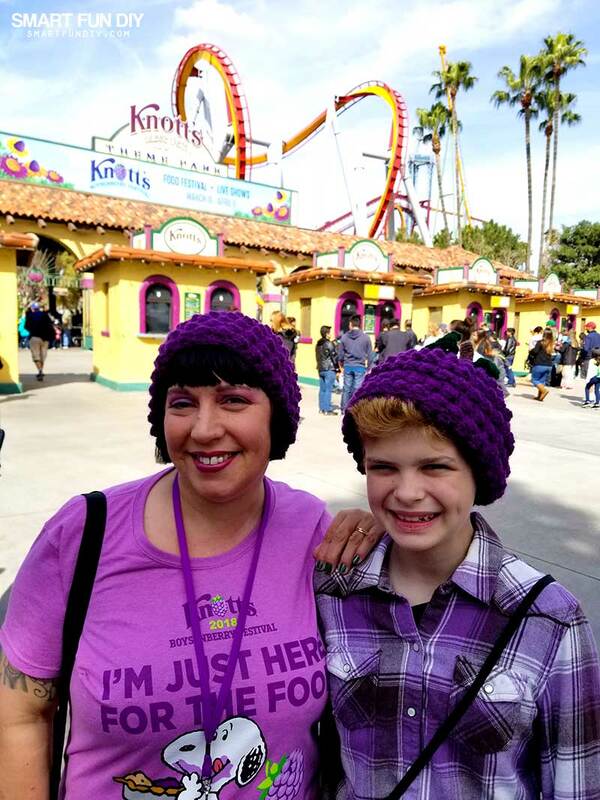 We found the best selection in the shops outside the gate by Mrs. Knott’s Chicken Restaurant. Inside the Wilderness Dance Hall (same location as the wine tasting) there's also an art show! 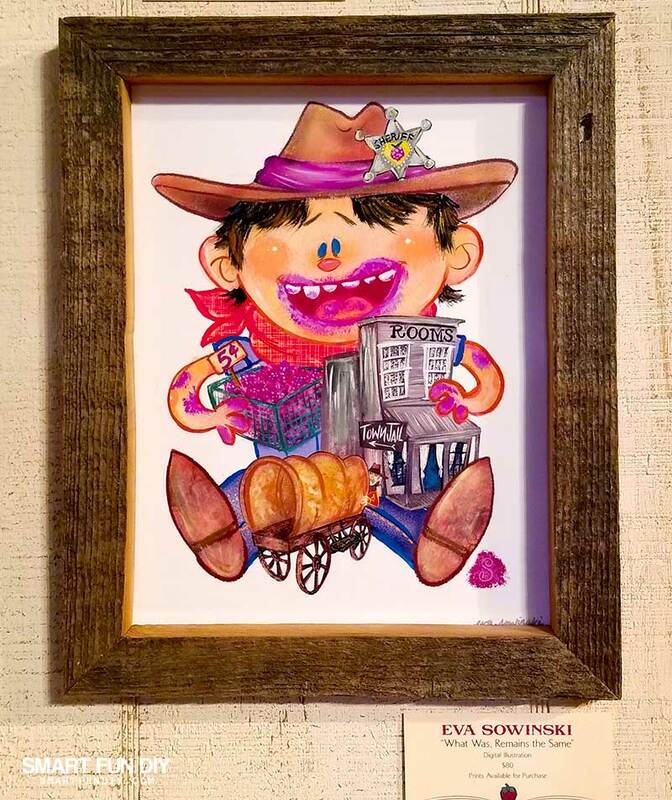 You can purchase the original art pieces but you can also buy prints in the Wilderness Lodge. And bonus, if you want grow boysenberries in your backyard like we do, you can pick up live plants right there in the park! 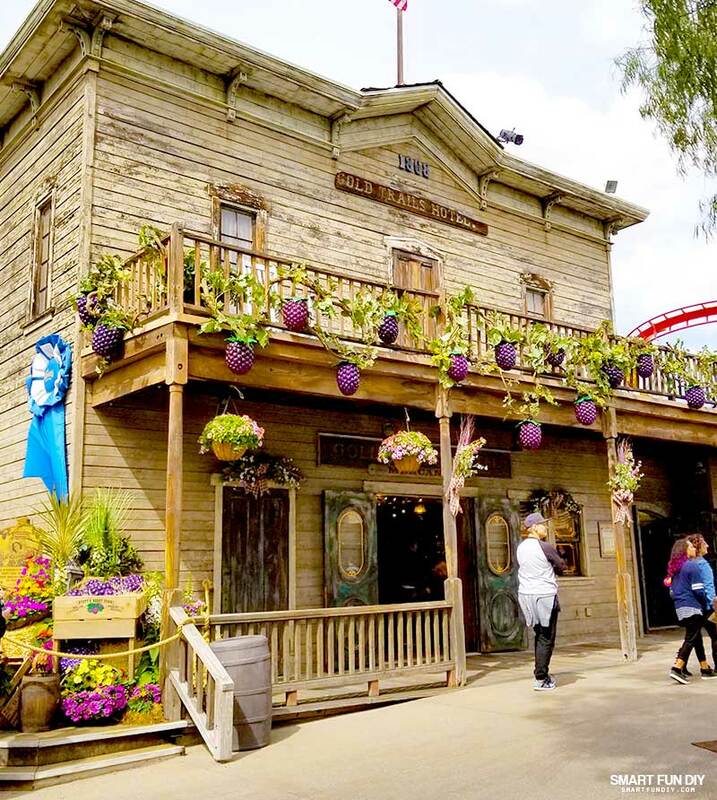 Before you leave the Ghost Town and head to the park exit, pick up a live boysenberry plant at the stand at the entrance of the Ghost Town. They can even grow in a raised bed garden! Against that dad’s advice, we even got to ride some rides! 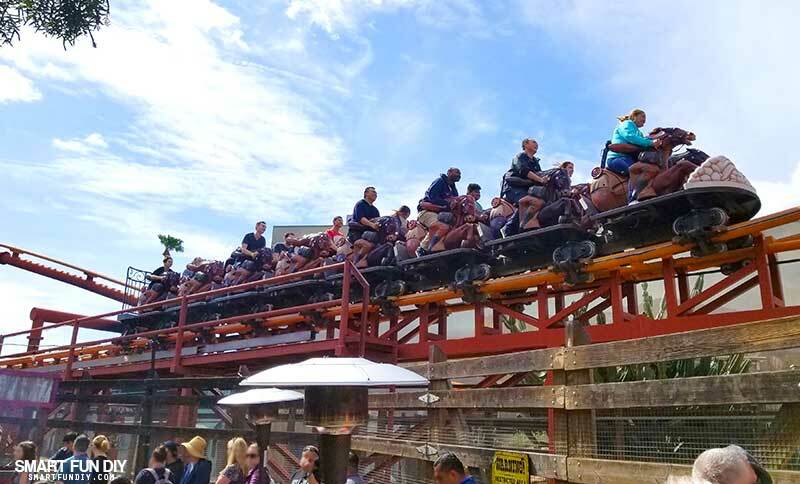 Get there early and you’ll be able to sample all of the food and ride the rides too. 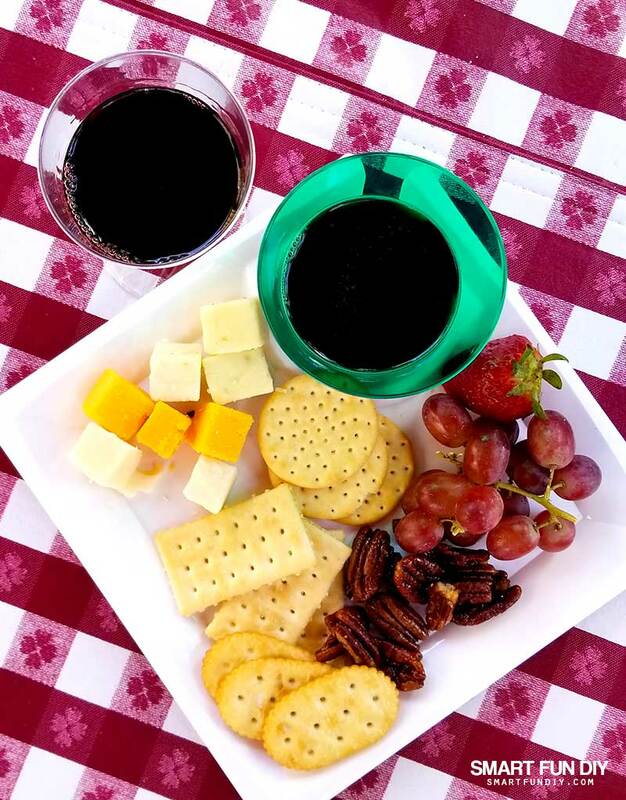 Enjoy live music, dancing, and entertainment while you sample the gourmet boysenberry dishes throughout the park! 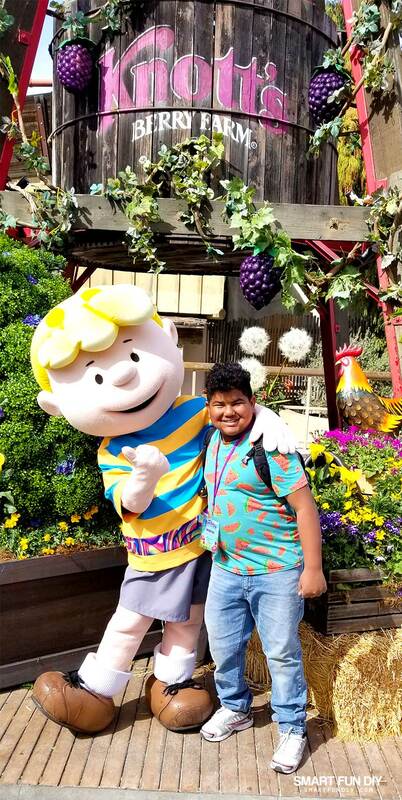 And don't forget to catch a photo with the classic Peanuts characters around Knott's Berry Farm, like Schroeder here. 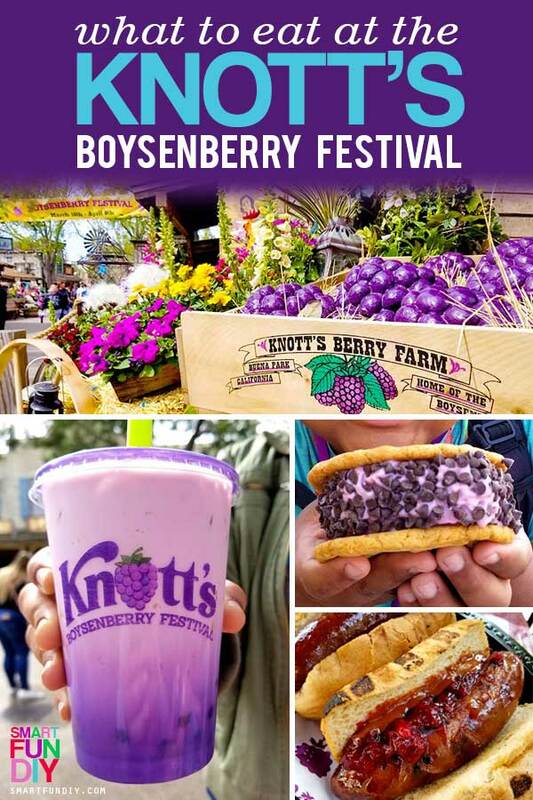 Are you planning to head to Knott’s for the Boysenberry Festival? I’d love to hear what you’re looking forward to the most! 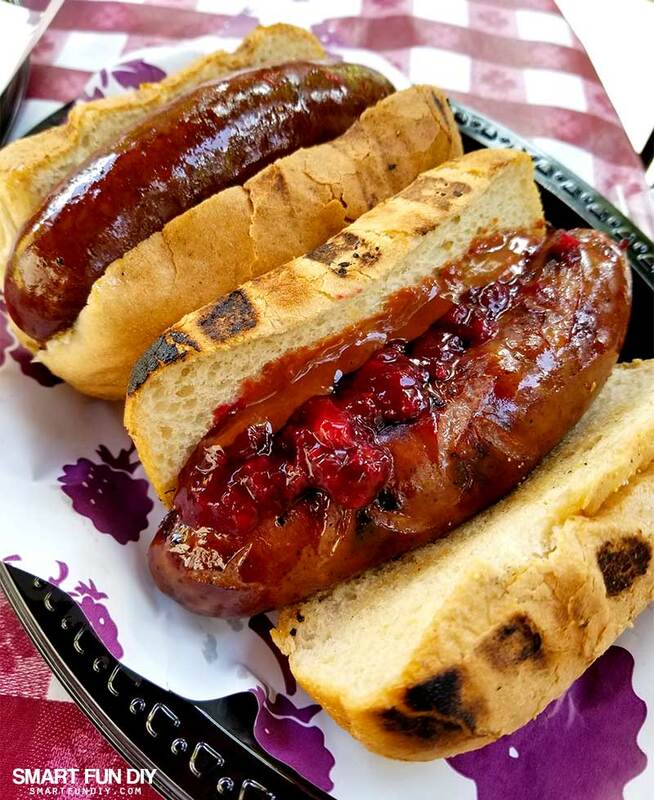 And if you’ve attended the Boysenberry Festival, leave me your best tip in the comments. Now I’m off to go finish pruning my boysenberry bushes in preparation for the spring time bloom! Magnolia Table Tour … we went to the Grand Opening! This post is making me hungry with all these beautiful pictures! 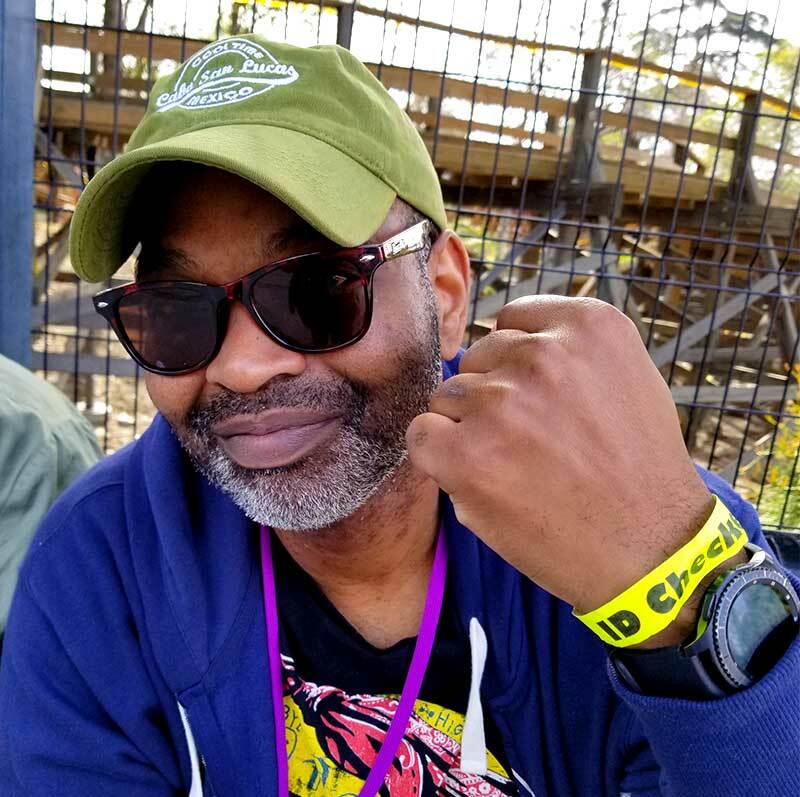 I went to Knotts Berry Farm when I was 15. That seems like light years ago. Thank you for sharing with us at Celebrate Your Story and have a great weekend. My goodness, they sure do it up right, don’t they?! 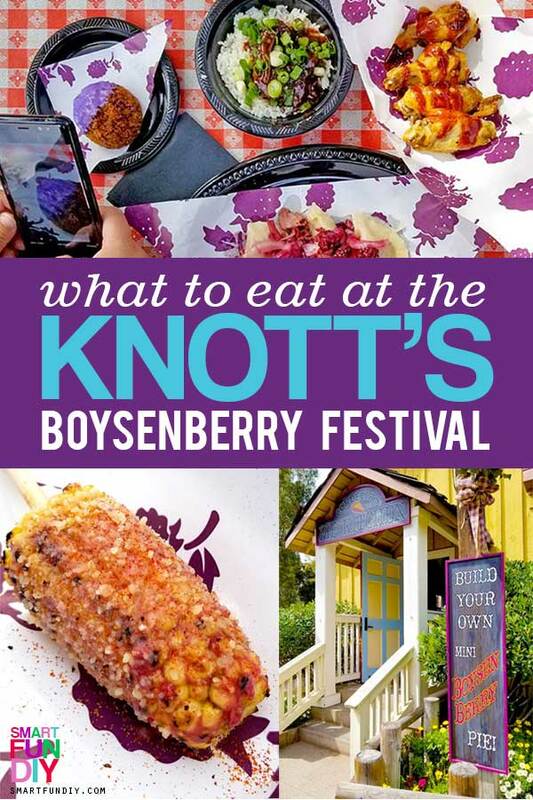 Looks like wonderful fun, but I am not sure about all those food choices with boysenberries, lol! 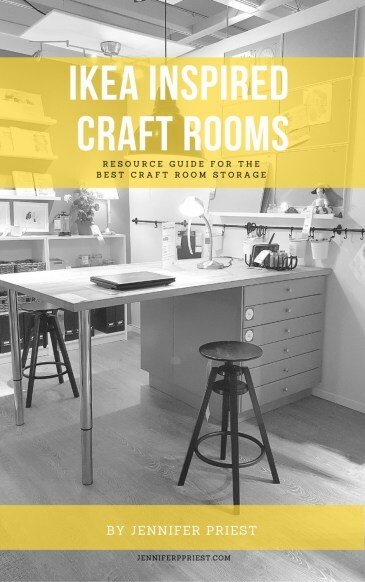 Thanks so much for sharing with at Create and Celebrate!